If you want to straighten crooked teeth with a more natural looking solution than braces, Invisalign could be the answer. Invisalign is an invisible form of braces offered by East Bentleigh Dental Group to straighten the teeth and close gaps between teeth. 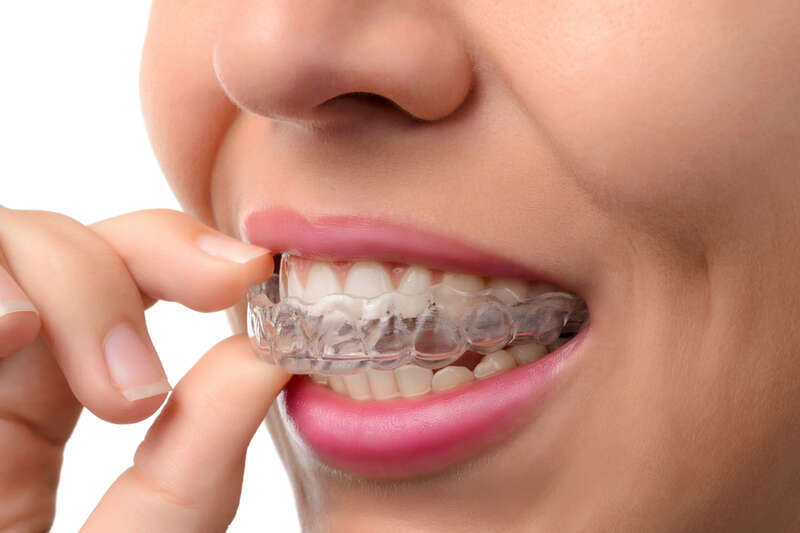 Comfortable and safe, the clear Invisalign aligners can be easily removed for eating and drinking, making them a popular alternative to braces for teenagers and adults. Invisalign is an orthodontics treatment that uses a series of removable aligners to gradually correct misaligned teeth. It straightens your teeth without the discomfort and appearance of traditional braces, making it a popular choice for both adults and image-conscious teens. Trusted by many of our patients, Dr Harry Marget is one of the country’s leading Platinum Melbourne Invisalign providers. His extensive experience makes him a trusted provider of Invisalign in East Bentleigh for patients looking for the best way to transform their smile. As one of the first dentists to be offered the choice to provide this unique service, he has many years of experience providing this and other unique orthodontics services. Invisible – Thanks to its unique invisible aligners, Invisalign can straighten your teeth without anyone knowing you are wearing them. This makes it an ideal choice for those who feel self-conscious about the appearance of their smile or who are anxious about how braces may look. Removable – During Melbourne Invisalign treatment, eating, drinking and brushing your teeth is easy. This is because the Invisalign aligners can be removed during these activities so they won’t interfere or become damaged. The aligners can also be removed for photos or special events. Comfortable – Unlike traditional braces, Invisalign has no wires or metal brackets that can irritate your mouth, and there is no painful tightening of brackets. This makes it a superior option for those looking for a comfortable solution for straight teeth. Safe – Invisalign doesn’t contain wire or protruding metal, meaning the aligners won’t scratch or puncture the inside of the mouth. They’re also much less likely to cause cavities and gum disease than conventional braces that can make it difficult to clean the teeth. Melbourne Invisalign treatment involves wearing different aligners that work to adjust the position of your teeth over time. These aligners are custom made and replaced every few weeks to gradually move teeth into the correct position. Who Can Get Invisalign Fitted? If you have crooked teeth, it’s likely that you’ll be a candidate for Invisalign at our East Bentleigh dental clinic. Make an appointment with our Invisalign dentist today to learn more. What Are Invisalign Aligners Made From? The Invisalign aligners are constructed from a safe thermoplastic material, with no metal used. This makes them more comfortable than traditional braces made with metal. Treatment with Invisalign typically takes 12 months for adults. However, the necessary length of treatment can vary from person to person due to factors such as age and positioning of teeth. Your estimated treatment time will be discussed with you during your initial consultation for Invisalign in East Bentleigh. Can Invisalign be Used to Close Gaps between Teeth? To find out if Invisalign is right for you, make an appointment for a consultation with East Bentleigh Dental Group today. We’re happy to answer any questions you may have about our Melbourne Invisalign treatment and provide you with an estimated cost for treatment. To make an appointment, call our clinic on (03) 9575 1100 or fill out our online booking form.